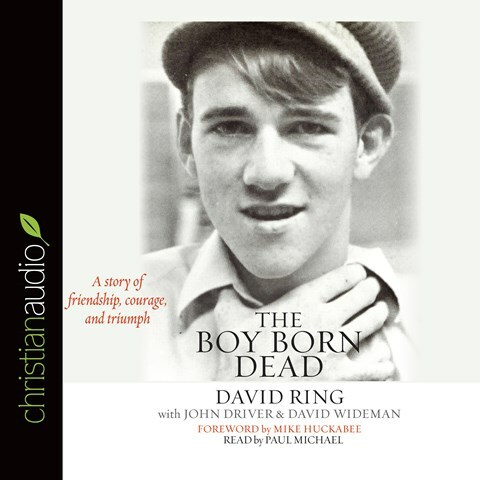 Hope endures – read for inspiration, with your ears! Neglect at birth left David with cerebral palsy. Orphaned, he was rootless and abused in the foster care system until he was befriended in high school by another David who inspired him to complete his education, rise above his past, and become an international speaker to inspire countless others through ministry. In her Afghan village, young Zulaikha hopes and hopes – for a school, for cleft-palate surgery, for peace. God willing ‘Inshallah’ – her new friend will teach her, the arriving Americans will fix things, her stepmother will love her – but is hoping enough? When has hope gotten you through the bad times? 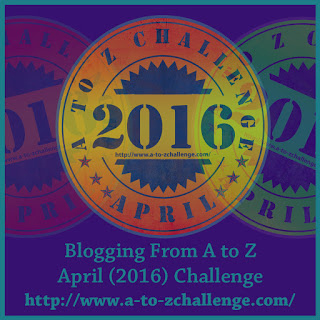 R is for Reading Rainbow!! I got to hear LeVar Burton speak yesterday at the Texas Library Association conference – yay! His Kickstarter to revive and add to the classic kids’ TV show Reading Rainbow was a phenomenal success, as this photo shows. 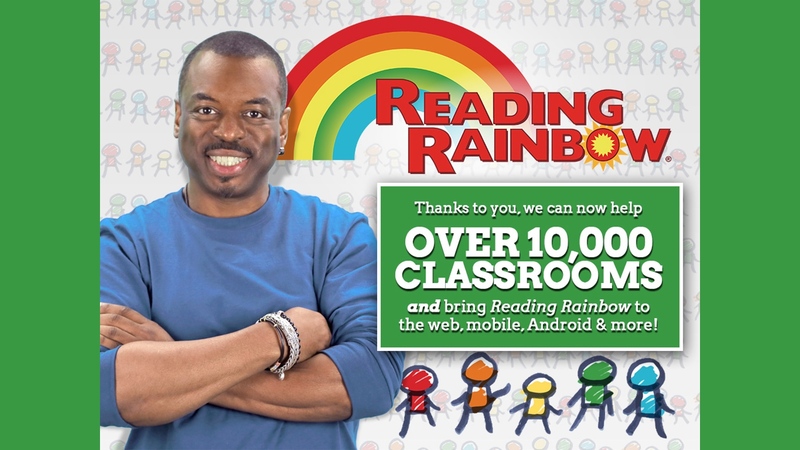 On the new Reading Rainbow site, you can find your favorite Reading Rainbow episodes on Netflix, DVD, or iTunes, check out the subscription-based Skybrary Family online kids’ reading library of videos and books, and the new Skybrary School which offers the same for elementary classrooms and kids. Meeting authors and discovering upcoming books is such a great part of TxLA – hearing literary luminaries speak is a huge bonus! L is for Library – Happy National Library Week! Thanks for cartooning yourself for the celebration, Gene Luen Yang – love your Boxers and Saints graphic novel pair (my recommendation here), plus your reimagining of the Green Turtle vintage comic (read more here). 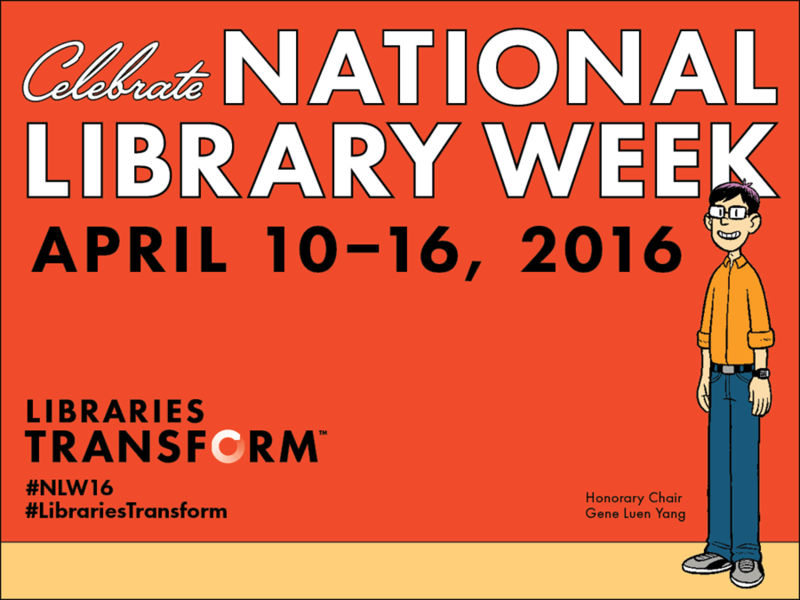 Share how libraries have changed your life or community with the #LibrariesTransform hashtag all year long. During #NLW16 or any week, this particular long-time librarian would love to hear your favorite library story. If you’re reading this blog post, you’re part of the literate majority, those who can navigate the modern world and all its written commands, warnings, and enjoyments. But too many adults, worldwide and in the USA, cannot read or read well enough to fill out employment applications, understand official notices, or help their own children with homework. On #GivingTuesday, or any day, you can donate to many worthy causes, including those working to reduce illiteracy and increase literacy. I’m a big fan of First Book (FirstBook.org) and Reading Is Fundamental (www.rif.org), which get books into kids’ hands so they can become better readers for life. Please support literacy causes locally and globally by volunteering or donating – literacy is for everyone, forever. Indie bookstores for Small Business Saturday & every day! buy books from small business day! You’ve seen the numbers – dollars spent at local businesses recirculate in your community much more than what goes into chain-stores’ coffers. 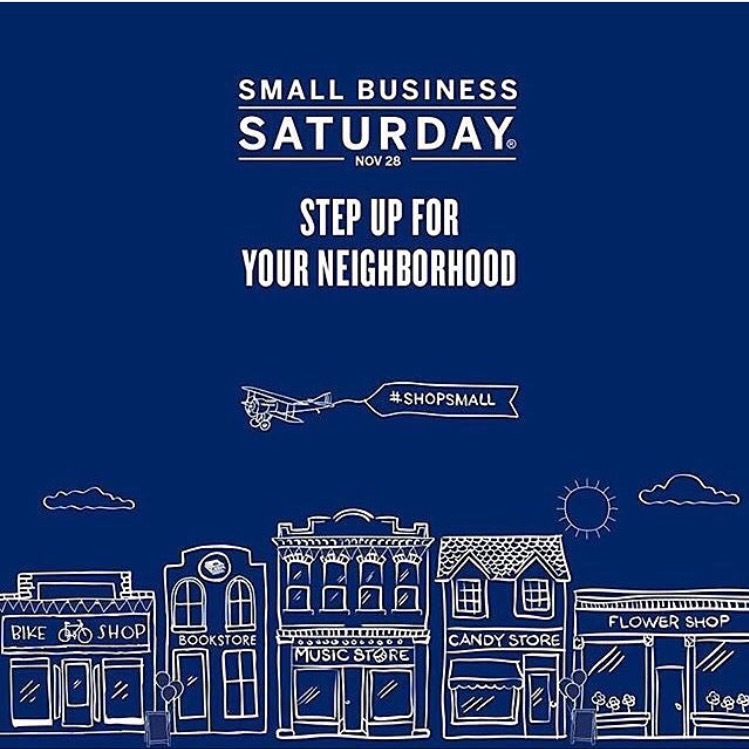 While Small Business Saturday was started by a credit card company, it’s a great reminder of the wonderful resources in own neighborhoods and towns. Our independent booksellers are near and dear to my heart, as they curate collections of local interest, find just the right book for that just-right gift, and bring in authors/illustrators to speak, meet, and mingle with avid fans and soon-to-be enthusiasts. And, of course, they choose books beyond the bestsellers mass-marketed by the big-box stores – like the titles I recommend here! So how can you #shopsmall if you don’t have an indie bookstore in your town? Most indies will ship to you gladly. 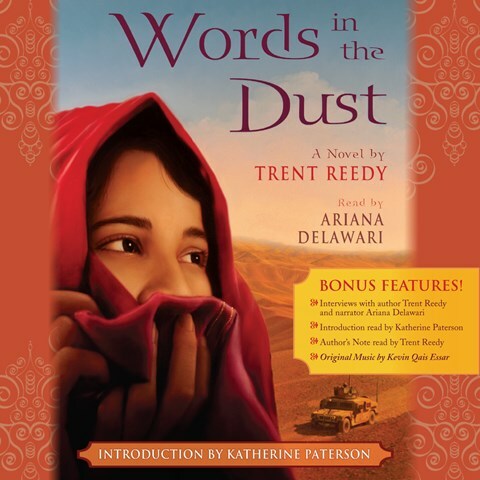 Two of my favorites are Powell’s Books in Portland, Oregon (powells.com) and Quail Ridge Books in Raleigh, NC (www.quailridgebooks.com) – please note, these are not affiliate links, just pointers for your convenience. Check independent bookstores for autographed editions, wishlist-building, special sales, and shipping deals for the holidays – and year-round. And if you ever need ideas on books to buy, you know that you’ll find them here! Happy book-buying and happy reading – what’s on your book wishlist? 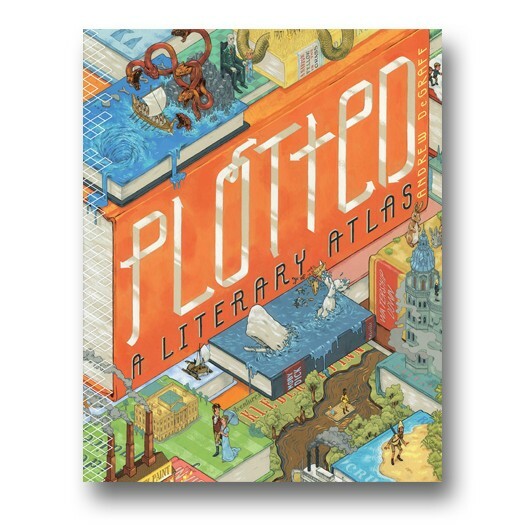 Happy book birthday this week to Plotted: A Literary Atlas! I liked it so much that I almost posted this recommendation well before its publication date, but rescheduled so as not to whet your appetite for these uniquely visualized story-maps before you could actually acquire this fascinating book. Enjoy literary maps of Charles Dickens’ A Christmas Carol and of Richard Adams’ Watership Down in this free preview from the publisher, then go get this book to see all the intricately detailed maps, so evocative of each of the 19 books selected while using no quotations at all. Do you create mental (or actual) maps as you read a book? Book info: Plotted: A Literary Atlas / art by Andrew DeGraff, essays by Daniel Harmon. Zest Books, 2015. [artist’s site] [publisher site] [time-lapse artist’s video] Review copy and cover image courtesy of the publisher. My book talk: Mental maps created by reading stories blossom into intricately designed maps on the page in this “literary atlas” covering 19 selections from ancient days to the present, as seen through one artist’s eyes. Whether mapping the movements of selected characters (as in his panels for A Wrinkle in Time) or conveying a wider sense of the book’s narrative (like the Kafka story, “A Report to the Academy”), DeGraff includes numerous details from each work in his hand-painted maps. Wander through Elsinore act by act with the many characters of Hamlet, travel the Mediterranean with Odysseus, and trace the complicated path of true love in Pride and Prejudice. Essays by Daniel Harmon accompany each nearly wordless map-set which brings fresh views of stories for readers to consider and appreciate.